The professional firefighters in your community are trained to provide many services including the traditional role of fire suppression. We work daily to hone our skills in such disciplines as technical rope rescue; swift water rescue; confined space rescue; hazardous materials response; heavy rescue (industrial type accidents); auto extrication (motor vehicle accidents); Trench and Heavy Urban Search and Rescue; Wildland Interface (forest fires); First Responder emergency medical response; fire investigation; fire safety building inspections; fire prevention education programs and other critical tasks relating to emergency response and emergency rescue. 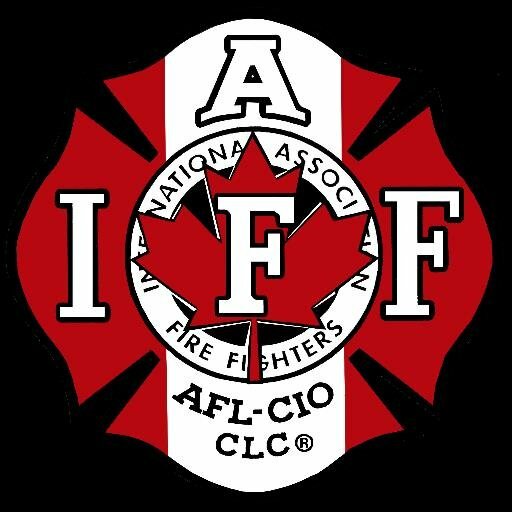 We are Local 1782 of the International Association of Fire Fighters, an organization now over 315,000 members strong, protecting 85% of North America’s population. We are also members of the BC Professional Fire Fighters Association. The BCPFFA is an organization which is comprised of the 53 IAFF locals who represent the professional men and women firefighters of this province. All 53 locals are members of the IAFF which serves the more than 18,000 Canadians for whom firefighting is a career. There are approximately 4,000 career firefighters in B.C. We are also very proud of our volunteer hours spent raising awareness and funds for various charitable organizations in our community through our Coquitlam Firefighters Charitable Society. From our annual Gala Ball to boot drives, we strive to enrich the lives of citizens in our community by providing charitable initiatives and collaborating with other charities and non-profits that share in our vision and goals. 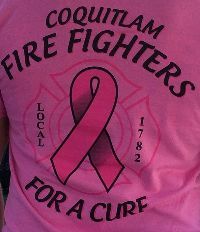 The Coquitlam Firefighter's Union represents 168 firefighters proudly serving and protecting the citizens of Coquitlam, BC, Canada. 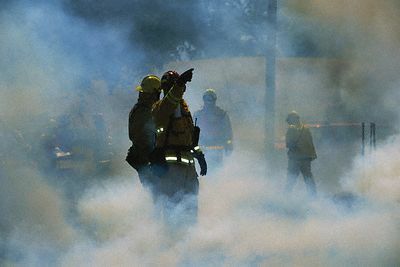 Firefighters and nurses are the only professionals respected by more than nine-in-ten Canadians, a new Canada-wide Insights West poll has found. In the online survey of a representative national sample, 92% of Canadians say they have a positive opinion of firefighters, while 91% feel the same way about nurses. https://insightswest. 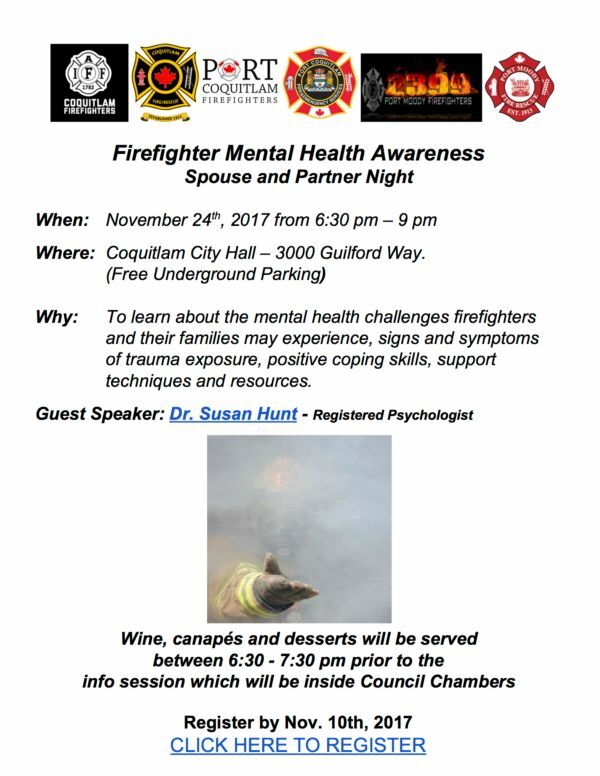 Coquitlam Firefighters are proud to join forces with Port Coquitlam Firefighters - IAFF Local 1941 and Port Moody Firefighters to co-host a Tri-City mental health awareness/information night for our spouses and partners! Our special guest Dr. Susan Hunt (registered psychologist) will lead a discussion on trauma and how it effects firefighters and their families. 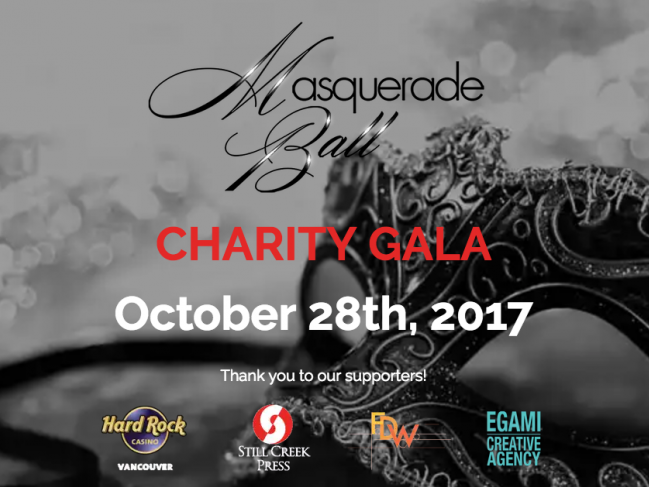 The 4th Annual Firefighter's Gala is a fundraiser to help feed underprivileged and vulnerable children in the Coquitlam area through a “Nutritional Breakfast & Snack Program". This program is designed to relieve hunger by providing healthy food so kids can concentrate in class and succeed in school. 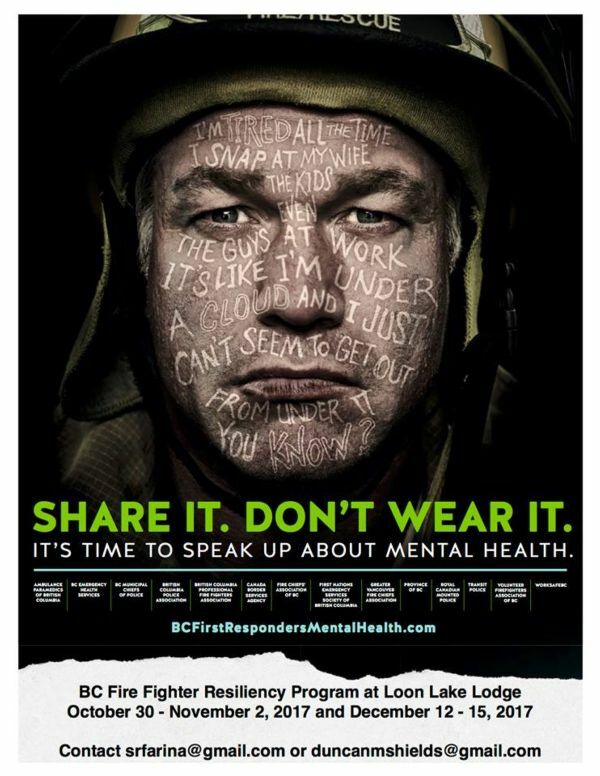 For those that are interested or may have a firefighter friend that is in need, please share these links with them: https://sites.google.com/s/0By5WO5bYV82XcU5DYVZQdEdDTFk/edit?authuser=0 http://bcfirstrespondersmentalhealth. Ignite your passion. Ignite the possibilities. Ignite tomorrow’s opportunities! Camp Ignite will show you a future of limitless opportunities and that regardless of your gender, anything is possible. Camp Ignite is a four-day camp that educates and inspires young women to follow their dreams. Here is a recap of what happened at Coquitlam Fire Rescue in 2016! We responded to over 7300 emergency incidents, spent 1000s of hours training, 3500 volunteer hours in our community and raised over $120,000.00 for various charities including the BCPFFA Burn Fund, Muscular Dystrophy Canada and our own Coquitlam Firefighters Charitable Society. 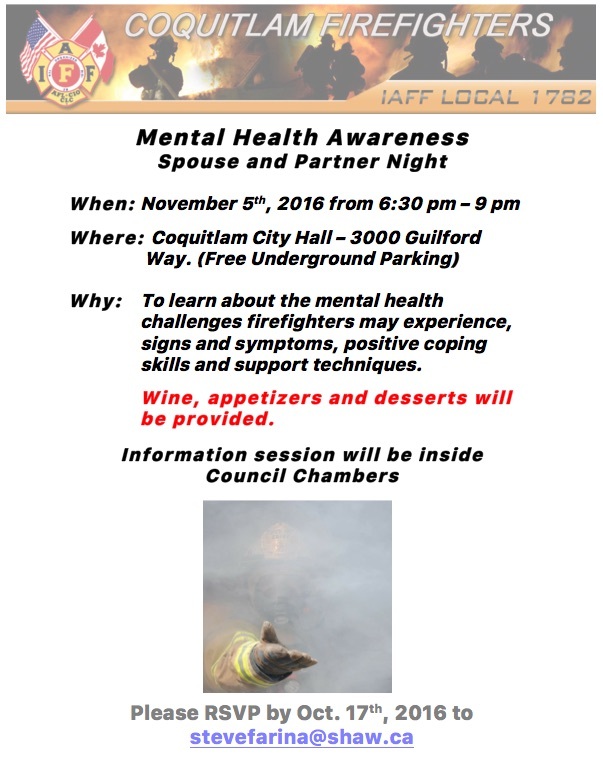 Mental Health Awareness Spouse and Partner Night When: November 5th, 2016 from 6:30 pm – 9 pm Where: Coquitlam City Hall – 3000 Guilford Way. (Free Underground Parking) Why: To learn about the mental health challenges firefighters may experience, signs and symptoms, positive coping skills and support techniques. Fire Rescue International Training Association is accepting applications from re service personnel interested in participating in the delivery of training abroad. Firefighters are no strangers to life-or-death struggles, battling flames to protect people and property every day. But the fight against cancer is one they tragically lose all too often. One such firefighter was Vancouver first responder Flynn Lamont, who succumbed to pancreatic cancer last year at the age of 59. 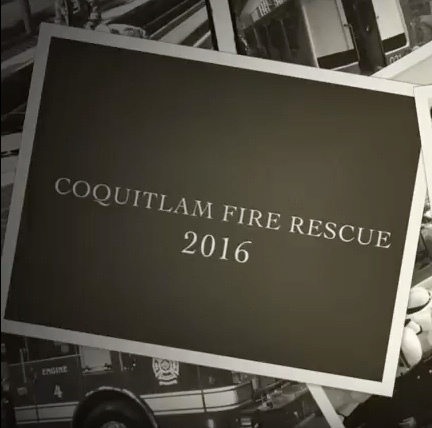 A short recap about what happened at Coquitlam Fire Rescue in 2015! We responded to over 6500 emergency incidents, spent 1000s of hours training, and raised almost $75,000.00 for various charities including Muscular Dystrophy Canada and our own Coquitlam Firefighters Charitable Society.